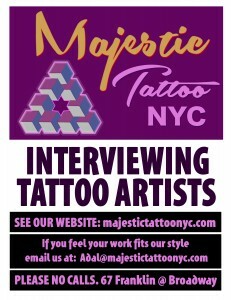 Majestic Tattoo NYC is ready to expand. Are you an experienced tattoo artist with similar style and portfolio as Adal, or a style that you feel would complement the artwork done at Majestic Tattoo NYC? We would love to hear from you. We will consider local and out-of-state applicants, if you are looking to relocate to NYC in the very near future. Please email the studio with links to your portfolio and attach your resume. No phone calls please. And as always, if you are an artist passing through, and would like to work out of our studio, please drop us a line. This entry was posted in About the Shop, News and tagged in tattoo artist NYC, tattoo employment, tattoo jobs, tattoo jobs NYC.